msbiro.net: We will be speaking at Connect 2016 , session proposal accepted ! We will be speaking at Connect 2016 , session proposal accepted ! 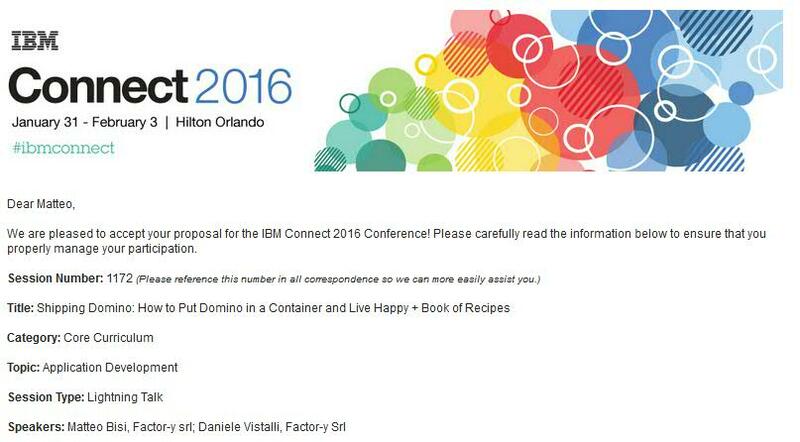 This year Daniele Vistalli, and I have sent together a session proposal for the next IBM Connect 2016 in Orlando next January form 31th undil Feb 3 2016 and yesterday we have received a great email ! Our session is named " Shipping Domino: How to Put Domino in a Container and Live Happy + Book of Recipes " and we like to explain something about Docker and how use that with Domino and other collaboration software. We will have a Lightnining talk of 20 minutes so we have to set something suitable for that time and that will be not easy ! We like to make also a full presentation and we are thinking to publish our full slides next on slideshare. See you all next January in Orlando !